Nearly done. I have almost every photo printed that will go in my final portfolio. I am still thinking of printing 4 more, but I'm not sure if I want them in there. My portfolio came in the mail and I really like the look of it. I think it will make the final portfolio look very good. All I need to do now is print my artist statement, cut some tracing paper, and put everything in the portfolio. These two images are ones that made it into the final. I liked the golden color of them along with the chrome and black holes. On this Innova paper, the gold color is extremely vibrant and I've been very happy with the prints that have turned out. I don't have a lot to say except it will be nice to enjoy this summer weather and even nicer to enjoy summer in a couple of weeks! This week has been pretty tough but rewarding. I now have three photos done which I have pictured above. 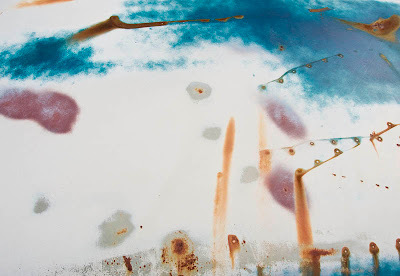 So far I am very happy with the Innova paper I am using. It gives a really rich print (after a few adjustments to the prints) and I cannot wait to see what it does to the next photos I will be printing over the weekend and next week. Time is getting short and I know this week will be really chaotic, but as long as all the pictures print the way these first three have it will be worth it. Anyways, I really don't have a lot to say about these photos since I have posted the drafts before, but I do like the richer quality to them now that they have been editted for the Innova paper. This is the second set from the photos I took at the Mustang Farm. I have been going through them as fast as I can so that I can get to doing final edits for the semester. These were some of my favorites out of the shoot. It was fun to go through the pictures though this week and see the progression during the shoot. I saw how awful some of the first photos, a peak about at the middle of the shoot, and the end photos were again awful. I must have gotten more burned out by the end of the day than I remember feeling. 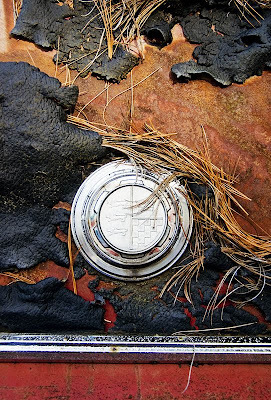 I like the first photo because of how cool the pile of hubcaps looked. 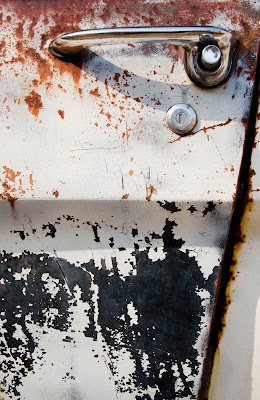 There were hundreds of shiny hubcaps and wheels there which looked so out of place among the heaps of rust surrounding it. 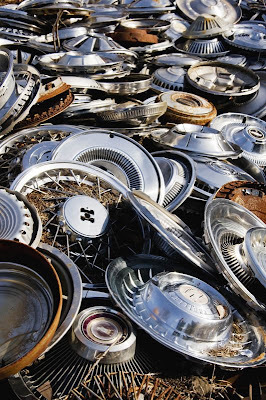 I hoping to generate the same reaction when I slip one of these hubcap pictures into the final portfolio. The other three photos are very much like the others I intend to put into the final. 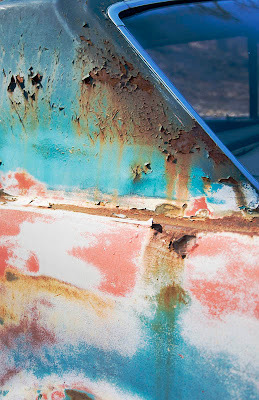 I really liked the way the colors appeared on the second photo along with the peeling and rust. The bottom picture had a beautiful gold color that amazingly remained after years of being left out in the weather. It amazes me sometimes how well these cars stand up to the elements. While doing this shoot I walked by a car with a leather interior that was nearly perfect, yet the outside was full of holes and will probably cave in with one nudge. 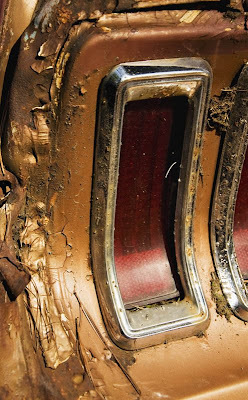 I also liked the silver trim against that dirty gold background. 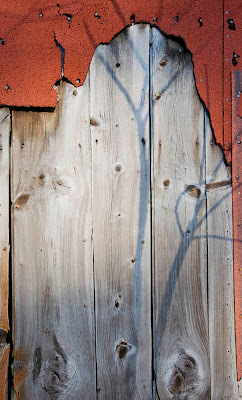 Over the next two weeks I will be posting photos the I hope to get into my final portfolio. Please let me know what you think! Things are coming fast. It amazes me that in one month we will all be on summer vacation and even more amazing that next year will be my last year as an undergrad. With the nice weather finally here and tons of work piled on the inbox, its hard to concentrate on actually getting things done. Last weekend was a welcome reprieve from school though. I got back to the Mustang Farm and spent much more time shooting there. The first thing I wanted to shoot was something that had been haunting me since I first saw it. 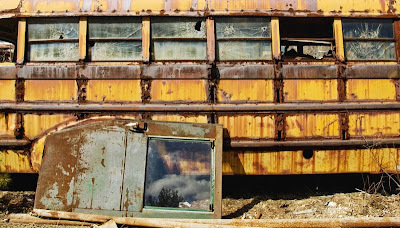 When I first saw the rusting school bus I was immediately drawn to it. I wasn't able to get any pictures of it on my first visit, but something about the way it sat tilted in the ground with large chunks of it missing and an old wooden wheeled car sitting on top of it all called out to me. 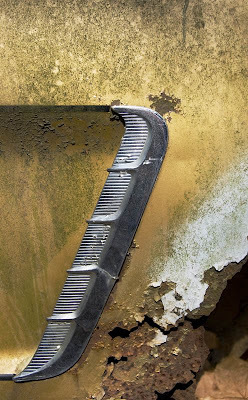 It was the quintessential junkyard find. It was also the brightest vehicles in the whole yard. 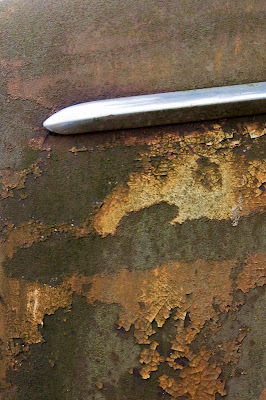 The yellow paint was starting to turn orange in areas because of the rust running down the sides. The image I have here is cropped from the original which I feel did make it better (thanks for the advice everybody). The other two images were taken at the same place. The more abstract one was actually taken as a bit of an afterthought. I thought the roof of that car looked kind of cool so I lifted the camera over my head and shot a few without really looking at them. I'm happy that that one came out well. The middle one was one that I feel fits in very well with the other pictures I took this semester. It is very similar to a few others I have shot in that it focuses in on one door with a look through the dirty, dingy glass. I'm really looking forward to finishing editting the rest of these photos and continuing to put them into some sort of final project. I'm leaning toward making a book right now so I have a lot of work ahead of me for the next few weeks! This week was not too productive on the new photos front, but I did get some time to go through my photos from this semester to start to pull together something for my final project. I would really like to make a book. I feel that it would be a good way to have something substantial to show after several semesters of work. I really hope that this will not be the last photo class I take here at Clark, but I have no idea what next year's schedule will look like. A book would be a nice way to finish off it that's the way it has to be. The two images are ones that I hope to put into the book. They are not final edits, but they are getting closer. I think the top one benefited from the crop we discussed in class. By letting that red color dominate the top and sides of the frame it becomes a little more important and I think it focuses the image. I really like how that one has come out so far with that shadow that lines up right in the cut out of red. I would like to get several more like this at the same time of the day. The second image is from the Mustang Farm that I visited two weeks ago. I feel that it is still a bit under saturated, but in general I like the way it came out. I have always loved the way old cars and trucks seem to be peering out of the weeds sometimes. 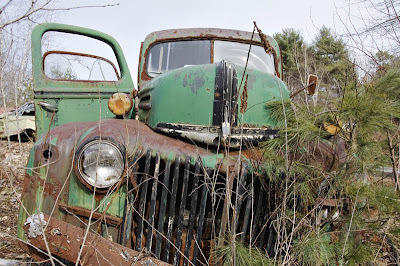 This abandoned Ford has definitely seen better days and with that one headlight looking out makes me think of all the forgotten memories this truck has been a part of. I will be returning to the Farm on Saturday to take a whole bunch of photos. Should be an exciting weekend! This was a great week! I finally feel like I found a place I can spend a lot of time photographing. 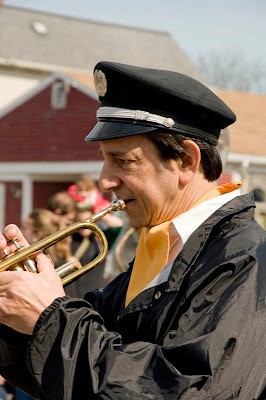 I traveled to Wrentham over the weekend to visit Tosy's Mustang Farm. I had read about this place on several websites I frequently visit and knew it was going to be a great place, but nothing could have prepared me for what I found. There were rows upon rows of Mustangs from 1964 to the late 1990s. Mixed among them were other Fords of various ages and conditions and a smattering of Ramblers, Volvo's, Dodges, and Chevy's. 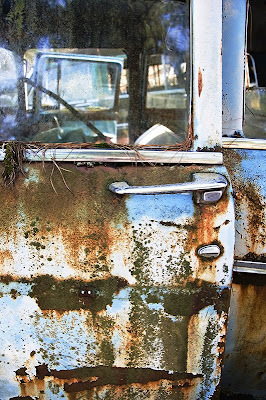 As I walked farther and farther back into the junkyard the cars got older and the photographic opportunities greatly increased. 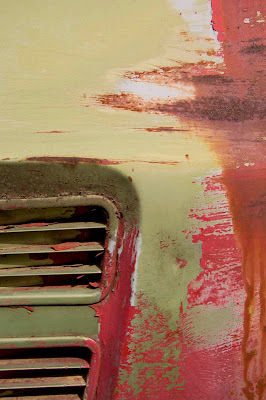 There are hundreds if not thousands of photographs to take there of aging paint and metal. In addition, this will be a great place to visit through the years to find parts and project cars. The pictures posted here are just a small showing of the photos I will take here. I did not take a lot of pictures on my first visit because I was unsure what their policy was. Some junkyard owners are very picky about people taking pictures, but after paying for a part and asking the owner he said it would be fine to take as many pictures as I wanted. Next weekend I will be going back hopefully on Thursday and Saturday to get a ton of pictures. 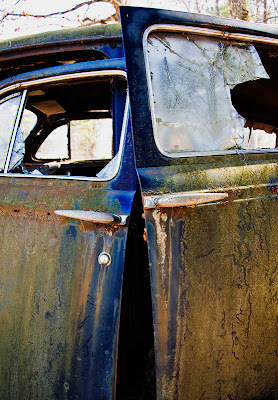 I cannot wait to get back in there and uncover the stories those cars would like to tell. This past week was spring break and I must say it was a needed and welcome break. I didn't do a whole lot of work, but it felt really good to just relax for awhile. I did however get to go down to the Cape at the end of the break which was awesome because I had not been down there since September. My brother also came down to shoot some event photos for a photography class he is taking. 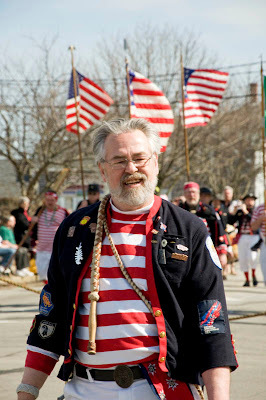 The pictures above all came from the St. Patricks Day parade in Dennis and Yarmouth. 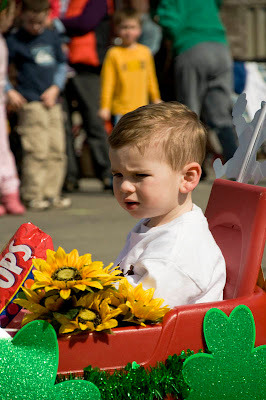 It was kind of strange to see St Paddys day stuff so early, but it was truly a fun day. I never realized how many true Irish people lived down on the Cape. The shoot was a lot of fun because although I like people photography I never really spend a lot of time doing it. I think I am slowly developing my comfort level with walking up to a stranger and taking their picture, but I always end up taking other pictures. I know I need to force myself to develop this and hopefully this will be a turning point in that endeavor. It was also fun because this was the first serious shoot I have done with my new camera since it was fixed. I think the pictures it is taking are excellent and I am very happy with them. 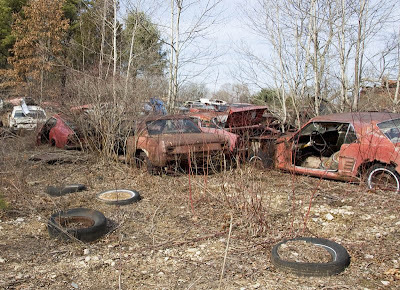 Tomorrow (actually today looking according to the clock) I will be traveling to Wrentham to visit Tosy's Mustang Farm to find some parts for my 82 Mustang and to take some photos of the cars in the junkyard. I'm very excited about seeing this place in person because I have heard a lot about it on the internet and it sounds like there is a huge selection of Mustangs and Fords tucked away there. Off to bed for an early rise! I still remember taking my first pictures with a disposable camera at an airport in New Hampshire. Since then I have learned about photography from my father and brother and now I am taking a photo class at Clark University and learning from Frank Armstrong. I look forward to continuing my photo education throughout my life and hopefully that will show in this blog. I currently shoot with a Nikon D90, D50, and FM10.